For the first time ever, I participated in a sponsored trip. Local mountain bike guide (Geobetty Tours) and publicity honch Don Baumgardt brought together El Paso riders along with the Ride For Reading crew and film makers to ride 70 miles across the high plains east of El Paso to Dell City, TX to deliver books to their school. Hot shot photographer Devon Balet and his numerous connections for sponsorship had us sleeping in some Big Agnes products which I feel very compelled to review. Note that we did not get to keep these products. 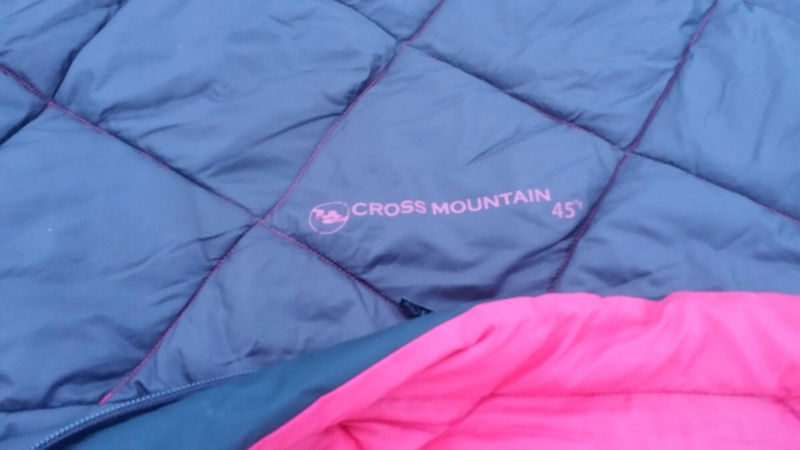 I think we were all given the same sleeping bag…the Cross Mountain 45 with synthetic fill. We had a variety of sleeping pads and a couple different tents. I chose to not sleep in a tent. It was just too nice outside. I did help set some up and I can tell you that they are extremely light and easy to set up. They came with really nice stakes and lots of reflective cord. 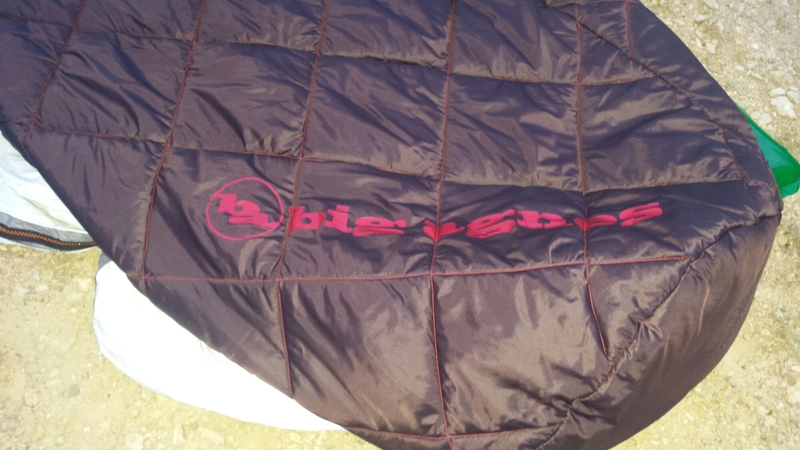 The sleeping bags were perfect for our cool nights and I heard few complaints. These are the bags with the sleeve for the sleeping pad. They don’t have insulation on the bottom relying on the pad to provide an insulating barrier between your body and the ground. I’ve always wanted to check one of these out and was excited to destroy the inside of one with my sweaty, dirty, and sunscreen caked naked body for two nights. 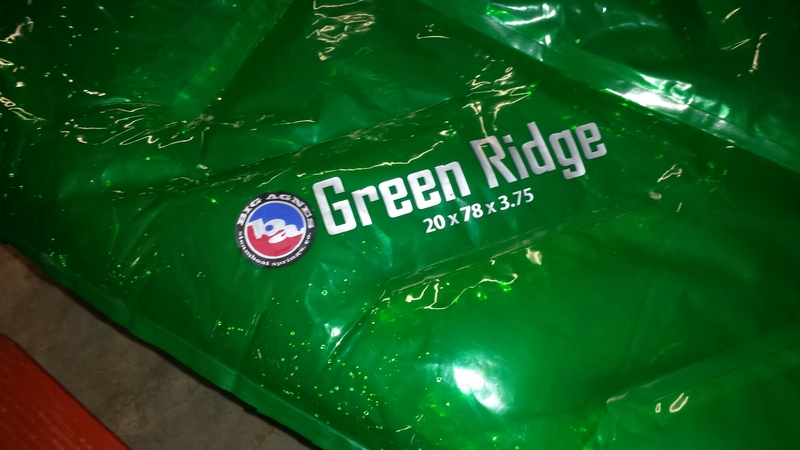 I was given the Green Ridge sleeping pad which I believe is their lightest pad….and weirdest. Weird in color and texture…like a dry condom. I didn’t slip it into the sleeping bag sleeve the first night, and being a restless sleeper, I found myself struggling to roll over and move around since my body was sticking to the rubber material. At only 20″ wide, the pad did not provide enough width for me. From the comments from the other party goers, none of the pads were wide enough for them either. All the provided pads were 20″ wide, but varied in material, weight, style, thickness, and length. A perfect rectangle, mine was 78″ long and 3.75″ thick….totally sufficient in those dimensions but barely wide enough for my shoulders. The pad was a bit noisy as well. 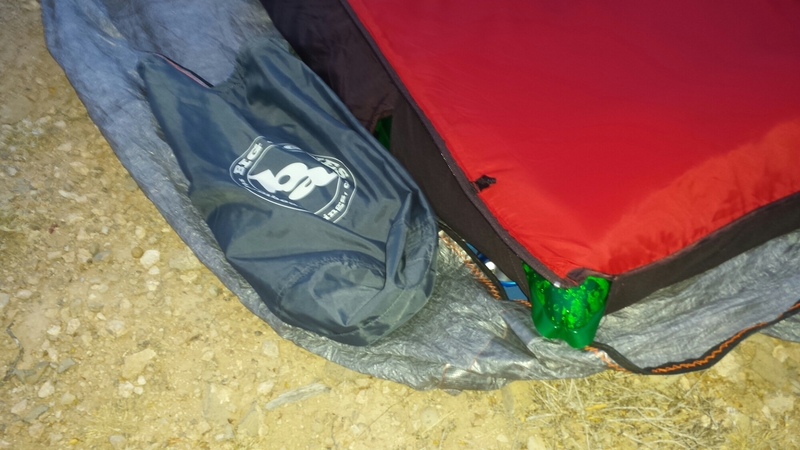 Not as noisy as the Mylar lined Thermarest NeoAir Xlite, but quite squeaky when you moved around on it….even when it was in the sleeping bag sleeve. In the middle of our first night, I decided to stuff the pad into the sleeve of the sleeping bag. This made things a bit quieter, but I noticed some air pockets. On the edges of the pad, the bag did not insulate well and at the top opening, there was no way to cover your head and shoulders since the opening was flat with no mummy hood or tapered closure. Air snuck in around my head and onto my shoulders. As a naked sleeper, this was no good. There was plenty of room at the foot of the bag and it extended off the end of the pad making it perfect for my size 15 feet. In the morning I left the pad in the sleeve, unscrewed the valve on the pad, and compressed it into the stuff sack of sleeping bag. There was plenty of room for everything including my 7′ long Cuben fiber bivy. The next evening, inflating the pad took a couple of minutes and everything was ready for sleeping…no fighting the pad to get it into the bag’s sleeve. This could prove a time advantage for someone racing the clock. Would I buy either of these products? Even with a discount, I would not buy these. The pad is not wide enough at all. The bag is a clever idea and someone who sleeps in a t-shirt may like the bag. I’m more of a mummy guy and like to be able to roll over with the bag staying with me when I move. I am impressed with the compressed size of the kit and the weight isn’t terrible. I think this would be a great bag for someone who regularly uses a tent since the tent would cut down on drafts experienced through the neck opening.